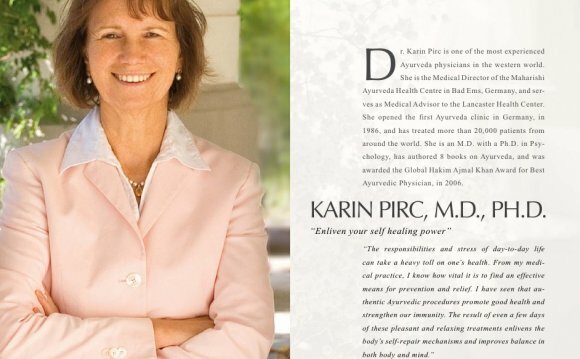 "I have practiced traditional, primary-care internal medicine for over 20 years. There always is a significant percentage of my patients who cannot be helped by the Western medical system. After finishing the level 1 MAAA course, I am now able to help many of those patients using Maharishi Ayurvedic medicine. My patients and I are thrilled." Maharishi Ayurveda Training Program is one of the best online learning programs available to Integrative healthcare providers. The information is laid out in a manner that is easy to understand and incorporate into ones practice. I am very excited to bring the benefits of Ayurveda to my patients. "This course provides valuable information that you can easily put into practice, not only in your medical clinic, but also in your daily life. This course in Ayurveda is bringing the holistic view of the human body back to modern medicine. It teaches valuable information that you can easily put into practice not only in your medical clinic, but also in your daily life." "I really enjoyed the course. It provided a lot of information, excellent structure, many opportunities for discussions and questions and a nurturing and pleasant environment. What more could one ask for ? I plan to recommend taking the course to a number of my allopathic physician colleagues, am already providing my patients with a lot of the diet/ayurvedic routine recommendations and am joyously looking forward to Level 2 training." "Maharishi AyurVeda® has inspired me to adopt Ayurvedic lifestyle changes for myself, and to recommend them to my patients. It has enriched my clinical practice with an approach to chronic medical conditions that is simple, yet profoundly effective." This course is designed for health professionals wishing to integrate Ayurveda into their practice who desire a highly professional, clinically oriented training program. Co-sponsored by the Academy of Integrative Health and Medicine, Atlantic Integrative Medicine, Guarneri Integrative Health, and the University of Maryland Center for Integrative Medicine, in association with Maharishi Ayurveda Association of America. This course added a profound healing dimension that I use every day with great results in my clinical practice and in my personal life. For those interested in integrative medicine, this course is a must! Participants will develop practical skills for the prevention, diagnosis and treatment of disease— including Ayurvedic pulse diagnosis—that can be immediately applied in your clinical practice, as well as your own life. Chronic Disorders—Discover new and practical non-pharmacological approaches to enliven the body's natural healing mechanisms and address the causes of common chronic disorders. Detoxification—Learn how to apply traditional Ayurvedic procedures for clearing toxins from the body that may be a cause of chronic disorders. Stress Reduction—Learn how to apply scientifically validated approaches to stress-reduction and mind-body balance. Lifestyle Changes—Learn how to individualize daily routines and lifestyle recommendations for your patients to prevent behavioral mistakes that cause health problems. Online CME/CE courses are available for specific categories of health professionals. These courses incorporate material from the 66-hour Level 1 program.